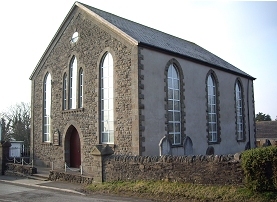 Tabernacl Chapel at Efail Isaf is a registered charitable company with over 200 members, and approximately 100 children and young people. The chapel is run on a daily basis by a large team of volunteers, and the work is co-ordinated by 14 directors. This is an Independent non-conformist chapel dating back to the mid 19th century. Situated in the lower reaches of the Taf/Rhondda valleys Efail Isaf is essentially a dormitory village to Cardiff and South East Wales, albeit a thriving and growing community. The chapel attracts its Welsh speaking congregation from a wide area including the villages of Pentyrch, Creigiau, Y Groesfaen, Llantrisant, Church Village, Llanilltud Faerdref, Tonteg and Miskin. There is also a weekly English language service. We are proud of the fact that the chapel is stronger today than it has ever been, and the members represent a wide cross-section in terms of age and religious background. We are very pleased to welcome visitors and new members, and we have a special provision for children and young people.